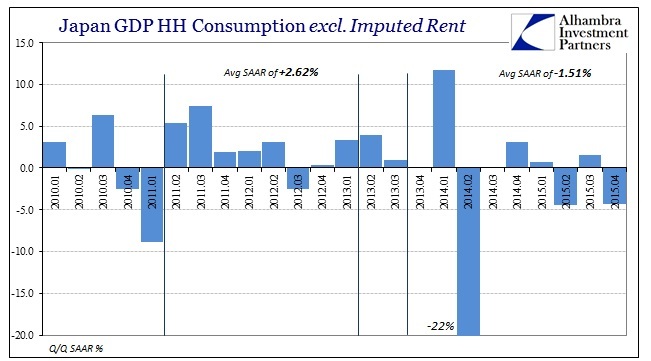 Household spending is 3.1% less at the end of 2015 than when QQE started. As with all the other central bank failures around the world, that comparison actually understates to a high degree the extent of the devastation. The true comparison is what “should” have occurred had QQE actually been effective at producing a true and sustainable economic advance as its practitioners had promised all along (even while for “some” reason adding to it). 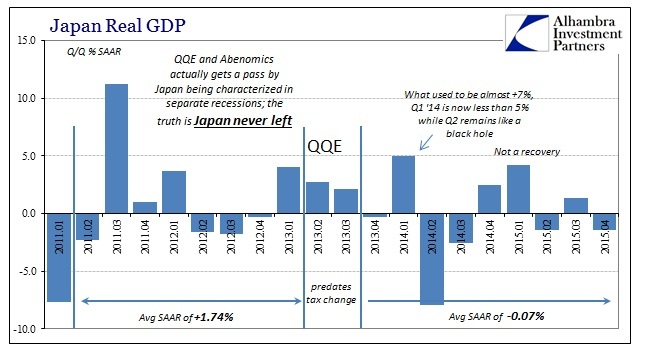 While economists try to determine if technical definitions for recession have been met, the plain truth of QQE is that monetary “stimulus” put Japan into recession almost immediately and it has never left. The key for any recession definition are the words “significant” and “sustained.” In other words, it is a significant and sustained deviation from the prior or underlying growth trend. 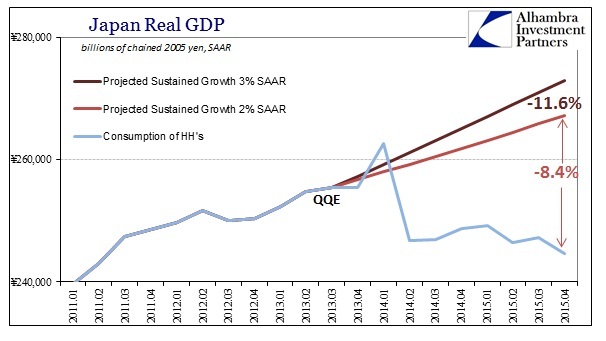 By Japan’s GDP figures alone, Japan is in a significant and sustained period of weakness or contraction even when compared to the unsatisfactory growth that prevailed before it. Since the first appearance of negative GDP in Q4 2013, long before the tax change, Japan’s average quarterly (SAAR) growth rate has been -0.07%. Period to QQE from just after the earthquake quarter, GDP averaged 1.74%. No matter how you present the GDP data, there was a significant change in economic growth dating to or close to QQE’s introduction. 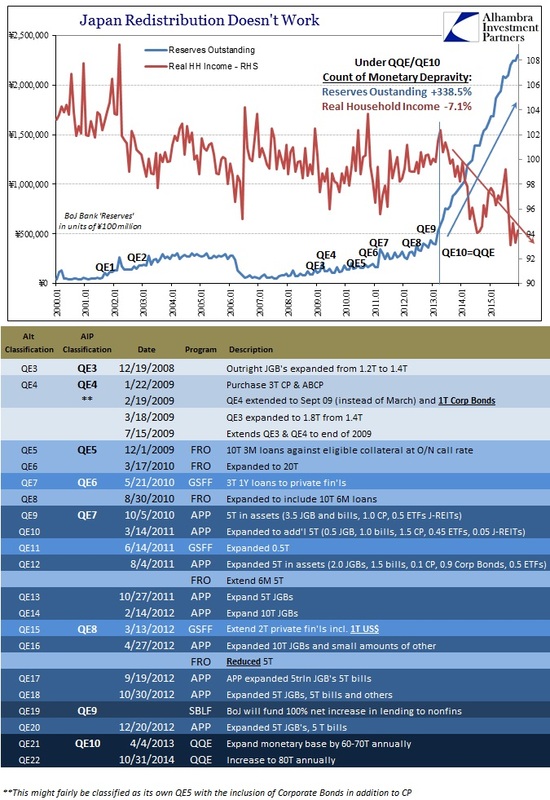 Since that burst of monetarism was enormous, just as policymakers had once claimed (curious, again, that commentary about QE in whatever form is derived by its tense; it will be powerful and effective vs. it was disappointing and needed more), that leaves little doubt as to the source of the economy’s digression from at least its prior trend, unacceptable as that might have been. 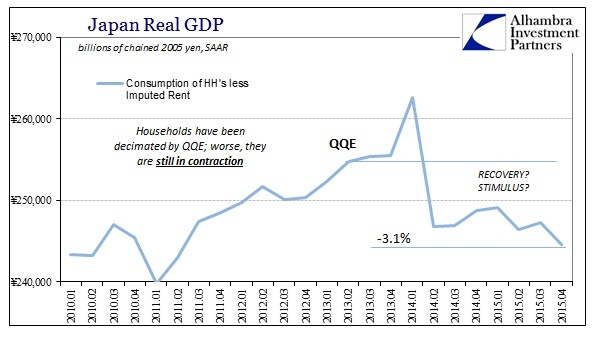 The fact that Japanese households have borne the brunt of the disaster only confirms its negating nature. Prior to QQE, household spending and income had been better than the overall GDP figures; after QQE, that relative position has reversed and intensely so. Nobody would accuse the Japanese economy of being robust between the tsunami and the start of 2013, but at least for households there was steady growth without “inflation” and disorder. 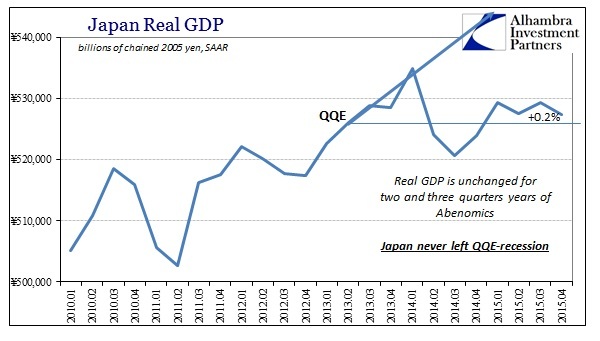 Japan was certainly in need of re-orientation and reform so that its system could finally become a full economy once again, but QQE was the exact opposite of what was required – especially since it was just amplifying what had already failed nine times (at least) before. The Bank of Japan and Abenomics in general put the Japanese economy into a recession from which it hasn’t yet recovered; nor are there any signs that it is even close to doing so. The conditioned response in the media and by economists is entirely the problem – it doesn’t take much to realize that “stimulus” created the recession, therefore more “stimulus” will likely only do the same. That’s an astounding piece of commentary after nearly three years; to have “no clear driver to support Japan’s economy” is utterly damning. Monetarism doesn’t work, that much is inarguable no matter which data you use or how you use it. That it is directly harmful may be somewhat debatable, but that view is becoming less so with each passing quarter. Japanese households, in particular, were at least experiencing some steady growth prior and now they are most certainly not. Central bankers declare that the cost of implementing a full recovery, yet it is nowhere to be found even in overall GDP (which is the most generous account of any economy). After three years (let alone fifteen), there is no basis anymore for “stimulus.” None.